We may have a few snow storms left, but winter is on its way out and that means many people's thoughts turn to the garden. This week we look back at pioneer gardening. Pioneer gardens were different in many ways from the home garden today. Now if the squash bugs kill the Hubbard or a late frost nips the beans there is always a store where produce is available. For pioneers if the garden failed gardeners had to hope one of the neighbors did better and was willing to share. We also have more ways of preserving the food we grow. Canning did not become common until the World Wars and the only freezer was a snow drift. If the food was not used fresh much of it had to be pickled, salted or dried. A few things such as winter squash and carrots could be kept in a root cellar with no further processing. It is difficult to know exactly what was planted in pioneer times. Most people simply recorded that they had planted a garden, not what was planted. Seed advertisements, letters and journals can give a glimpse into the pioneer garden. One of the first things planted when pioneers got to Utah was potatoes. It was mid-July and the potatoes that had been brought would not last until spring, so into the ground they went. Potatoes were an important crop. They are productive, a good source of calories, and will store through the winter. In "Plain but Wholesome" Brock Cheny gives an example of what the garden may have produced through the season. First were peas and radishes, then lettuce. Beans and corn came next, followed by tomatoes, cabbages, potatoes, and carrots. Also mentioned in histories are beets, cucumbers, melons,cauliflower. parsnips, onions and green corn. This last item, green corn, was not green colored but rather corn picked before it was ripe and hard. Today we would call it sweet corn. Some of today's common vegetables would have been absent in the garden. Zucchini was not introduced to America until the 1920s. Garlic was not used by the Northern Europeans or New Engenders who made up most of the settlers. 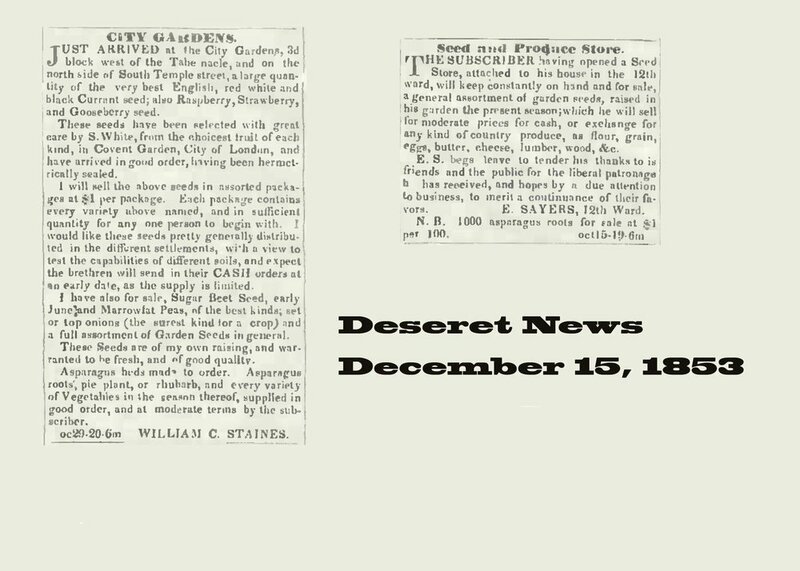 The "Deseret News" advertisements have some more terms we are unfamiliar with today. June peas are also known as English or green peas. These are what is found in bags in the frozen food section of the supermarket. Marrowfat peas are what are made into split peas. The top onions refer to Egyptian Walking Onions which have small bulbs on the top of the plant. While the purpose of gardening and the varieties of plants in them has changed over time, people today still wait for spring with seeds and hope. Valentine’s Day, as we know, is a day of love and romance. Lovers give each other flowers, candies, chocolates, and plan special dates. Over 200 million Valentine's cards are exchanged each year and that number doesn’t even account for all the cards exchanged in schools! In elementary schools across the country, children make special boxes for goodies and bring cards and candy with “Will you be my Valentine?” plastered all over them. But what started this grand tradition in the United States? Most valentine traditions we know of were brought overseas by European immigrants, which then began to spread. Lovers would often send valentines in the form of handwritten notes back and forth to each other during Revolutionary and Civil War times. 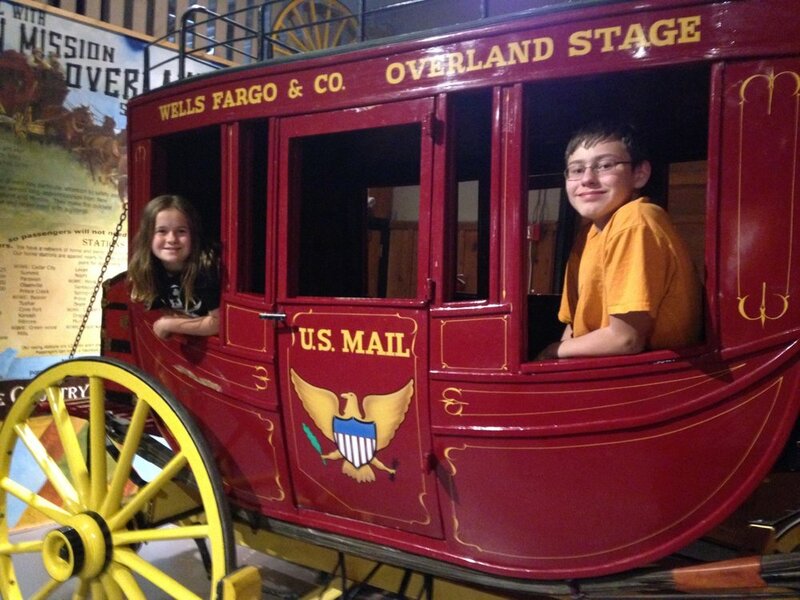 The Kansas Museum of History has a few Civil War valentines included in their collection. These two images here, “Faithful in Death” and “My Love” were sent to Elizabeth Ehrhart from her fiance, Joseph Forrest, who was a soldier in the Civil War. While both of these valentines are quite sad, they portray the deep love and faithfulness that Joseph had for his sweet love, Elizabeth. One type of valentine that was sent between loved ones was called the Puzzle Purse. It started in the 1700’s and became especially popular during the Victorian era. The Puzzle Purse is an origami style valentine where lovers could write special messages or include secret codes inside. Lovers could even place small gifts of love inside as well, such as a ring. If you click the following link, you can find out more about the history of this unique valentine as well as watch a video on how to make it yourself for someone that you love! This letter and envelope with intricate detailing drawn around the outside is a valentine’s letter exchanged between sisters Lavinia and Emily Dickinson during the time of the California Gold Rush. Mass production of actual Valentine’s Day cards, as opposed to handwritten letters, began after the end of the Victorian era in the early 1900’s, when exchanging love messages had picked up in popularity. The thing that makes Valentine’s Day so great is that it is so versatile. Couples can make the holiday special for themselves depending on their own styles and interests. There isn’t just one event that everyone takes part in, such as trick-or-treating on Halloween. There are so many unique ways to celebrate Valentine’s Day that will make it special for you and your loved ones. So go out and kiss your loved ones and tell them you love them. Maybe share some chocolate or a delicious dinner. My favorite is listening to scary stories from old time radio stations by candlelight with my husband. You can even choose simply to do nothing at all. Just make the day your own. Also, remember that chocolates go on sale the day after Valentine’s Day *wink wink*. Happy Valentine’s Day to you all!